These pumpkin scone cookies are cakes. That’s confusing. Why must we live in such a complex world? You never know what to expect when you pick up a new Trader Joe’s pumpkin product. Sometimes the pumpkin is overwhelming, other times the pumpkin is more of a vague suggestion. Trader Joe’s Pumpkin Scone Cookies fall into the former camp – very satisfactory, soft cookies with a very strong pumpkin taste. What it is: Soft, sweet, pumpkin spiced cakes. Price: $3.49 for 18 little cakes. Worth it: Yes – they’re tasty little snacks. When it comes to scones, it’s difficult to know exactly what you’re signing up for. I’ve had soft scones and hard cones, sweet scones and salty scones, pretty round scones and massive, bumpy scones. These scones fall into the first category on all accounts – soft, sweet and small. In fact, they’re not really much like a typical scone at all. It looks like Trader Joe’s tried to head this off by sticking “cookie” on the end of the product title, although they could have just as well put “mini cake” or “petit four”. Each one of Trader Joe’s 16 Iced Pumpkin Scone Cookies are absolutely light and delicate – dainty, soft rounds of cake glazed with a light brown icing that sparkles subtly. In taste, they’re very much like lightly glazed, molasses cookies. 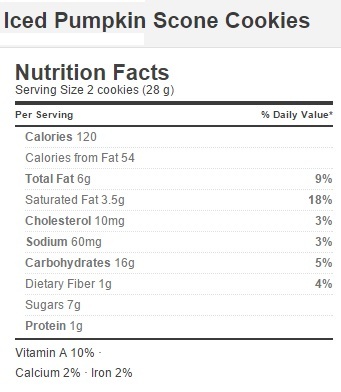 In fact, looking at the ingredient list, they share many of the ingredients with a typical molasses cookie. Where they differ, is the tremendous pumpkin taste packed in each little bite. I remember being shocked by the concentrated flavor in Trader Joe’s citrus-packed Key Lime Tea Cakes. While these aren’t quite that intense, they’re close. TJ’s has clearly gone to great lengths to ensure each bite is permeated with not just redolent pumpkin spices, but also rich, pumpkin puree. 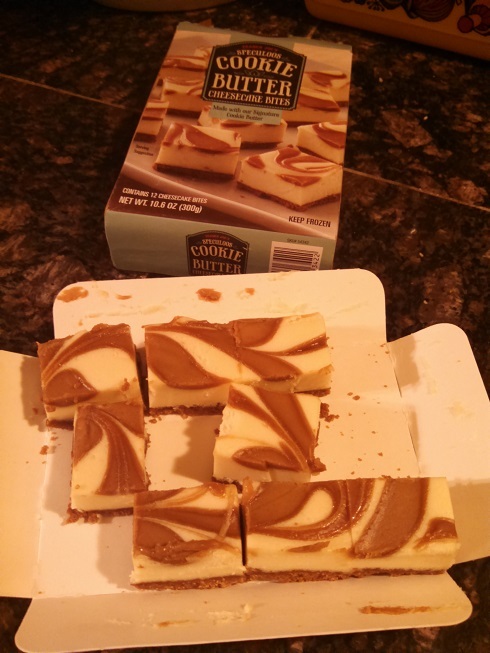 As a result, just one of these little cookies goes a long ways. Each little nibble is packed with plenty of pumpkin flavor, and they’re soft enough and sweet enough to make the nibble experience quite pleasant. Trader Joe’s releases hundreds of new pumpking products every year, it feels like. But with these pumpkin-flavored scone cookies, they’ve succeed in coming up with the perfect seasonal snack. I wouldn’t necessarily stock my larder with them year round, but they manage to so nicely encapsulate something of the autumn feeling, that I’ll be looking forward to seeing them again next year. Would I Recommend Them: Yes, these are very snackable, little seasonal treats. Would I Buy Them Again: Sure, I’ll pick some up again next year. Final Synopsis: Pumpkin packed little molasses cookies. The kind of panettone Jack Skellington would have been made. 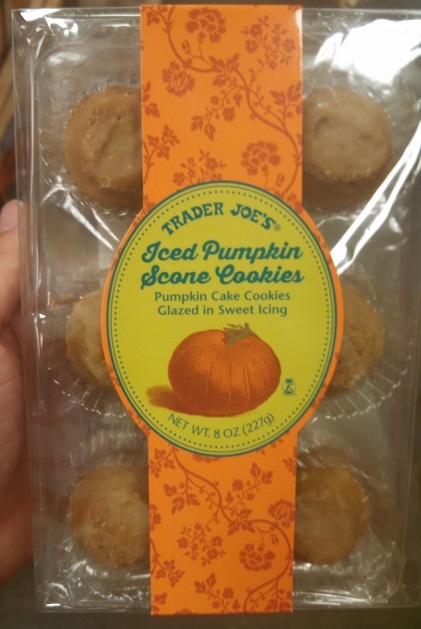 As you may have noticed from my unofficial first post last week – Pumpkin Season has returned again to Trader Joe’s! Today, we really get right into the swing of things with Trader Joe’s Pumpkin Panettone – a pumpkin-spiced, pumpkin-cream filled, Italian desert bread stuffed with candied pumpkin. What it is: A bready cake made with candied pumpkin. Price: $5.99 for a 26.5 oz cake. 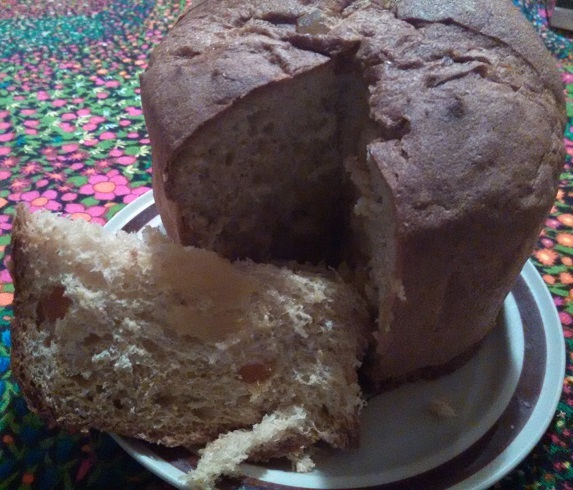 Worth it: No – not as good as regular panettone. Yes, as you can tell from the last sentence the annual pumpkin madness has fallen upon us again – the most exciting and, occasionally, harrowing time of the year. There’s no telling what fresh chimeras or monstrous hybrids the Trader Joe’s food scientists have cooked up in their labs, secreted far from judging eyes in the protective, pumpkin-scented bedrock of TJ’s Monrovia headquarters. The season of Pumpkin Madness at Trader Joe’s is a time to mentally prepare yourself before you go shopping – there’s no knowing what what miracle or nightmare may be lurking around every corner – from the heavenly delights of Trader Joe’s pumpkin-glazed, pumpkin cinnamon rolls, to the terrors of Trader Joe’s Non-Fat Pumpkin Greek Yogurt, to the mind-wrenching bafflement of Trader Joe’s pumpkin spiced pumpkin seeds and Pumpkin Joe-Joe’s. 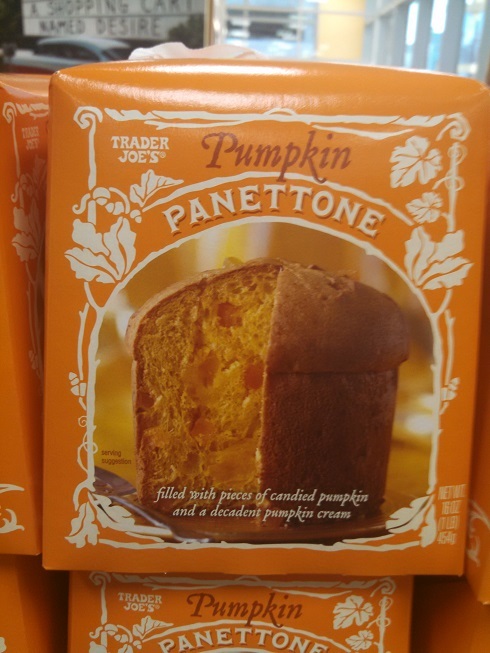 Where does Trader Joe’s Pumpkin Panettone fall in this pumpkin spectrum? That depends in large part how you feel about panettone in general. As you may or may not know, panettone (pronounced, approximately: “pa-nuh-toe-ni”) is a traditional Italian Christmas “cake”. I put cake in quotes here, because even though it’s generally referred to as such, panettone is much airier and “bread-ier” than the more common sort of American cakes. Like fruitcake, panettone is more of a concept than a set recipe, and is made as many different ways as there are people who make it. Nevertheless, all panettone are linked by a couple universal factors – they’re laced with dried or candied fruit, dabs of marscapone cream, and are always airy and bready. Trader Joe’s does carry regular panettone around the holidays, so they know how they’re made. This year it seems they couldn’t contain their excitement for the sweet bread any longer, and decided to bring us a unique, pumpkin-based version. Instead of candied citrus and raisins, there’s candied pumpkin. Instead of marscapone cream there’s pumpkin-flavored cream. There’s even dried pumpkin powder worked into the dough. With that much pumpkin, you might expect the cake to be a double-fisted pumpkin punch to the jaw. Instead, it hardly tastes like pumpkin at all. All you’ll really taste is the traditional, bready panettone cake, and the sugary sweetness of the cream and sugar. The actual pumpkin bits – as numerous as they are, have been denatured of their natural pumpkin flavor. At best, if you’re paying attention, you’ll notice a very, very subtle pumpkin aftertaste and that’s it. Pannettone – featuring candied pumpkin and pumpkin creme. The overall effect is somewhat bizarre. It’s like having a glimpse into some alternate universe where the twisted occupants make panettone for Halloween instead of Christmas. In fact, this is probably what Trader Joe’s has in mind for this product. Each Pumpkin Panettone comes packaged in a very nice looking gift box, including a pretty little ribbon handle – perfect for a little host/hostess gift. In terms of a nice looking gift, you could do worse. Show up with a Pumpkin Panettone and a bottle of wine to the seasonal autumn party of your choice and you’ll look quite dashing. Just don’t wait around the buffet table fishing for compliments – this panettone is likely to impress visually, but the taste is more likely to leave people scratching their heads than going back for seconds. If you like Christmas panettone you are likely to enjoy this – the pumpkin hardly makes an appearance, and the sweet bread aspect is dominant. If you’ve never much enjoyed panettone, or if you’re looking for something heavy on the pumpkin, you should pass this up. Alternatively, I would highly recommend punching it. The high, domed form of the panettone, combined with the soft and airy interior, make it an absolute delight to deliver a devastating front punch to. If you buy a Pumpkin Panettone, and you don’t like it, I’d definitely suggest winding up and letting one fly directly at the top of the dome before taking it back to TJ’s for a refund. Would I Recommend It: Not really – unless you like panettone that doesn’t taste like pumpkin. Would I Buy It Again: No thanks. Final Synopsis: Very satisfying to punch.